When will be Wild West C.O.W. Boys of Moo Mesa next episode air date? Is Wild West C.O.W. Boys of Moo Mesa renewed or cancelled? Where to countdown Wild West C.O.W. Boys of Moo Mesa air dates? Is Wild West C.O.W. Boys of Moo Mesa worth watching? The world was once a calm and gentle place, though after a meteor struck the surface of the planet, many of the animals had evolved into anthropomorphic beasts that were capable of performing many great triumphs, though along with their newfound characteristics came human emotion desires and wants, which lead some to stray along the path of crime. However, a group of friends in this new world decide that they don’t want to permit their fellow animals to be abused by the corruption of others, so they become the city’s police force and they work together to put an end to such acts of tyranny. EpisoDate.com is your TV show guide to Countdown Wild West C.O.W. 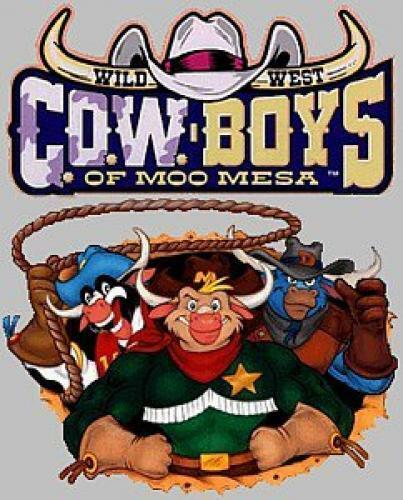 Boys of Moo Mesa Episode Air Dates and to stay in touch with Wild West C.O.W. Boys of Moo Mesa next episode Air Date and your others favorite TV Shows. Add the shows you like to a "Watchlist" and let the site take it from there.